Every year, scientists discover thousands of new animal species. 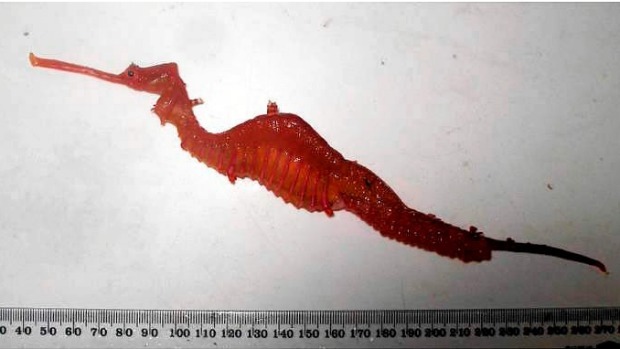 One of the cool species that was found this year was the ruby seadragon. Only four ruby seadragons have ever been found and the first one was 24 cm long. They are related to the seahorse family, which is a very unusual family because the males become pregnant with the eggs until the babies are ready to be born. The specimen that led to their discovery was a pregnant male, with dozens of babies in his pouch. The other two species of seadragons live in shallow waters, but these guys have been found in depths of over 50 metres. Their dark red colour is thought to help them remain camouflaged at such deep depths. Ruby seadragons are found off the coast of Western Australia and they are the first new species of seadragon to be discovered in over 150 years. Are there any other interesting facts that you would like to share about ruby seadragons?